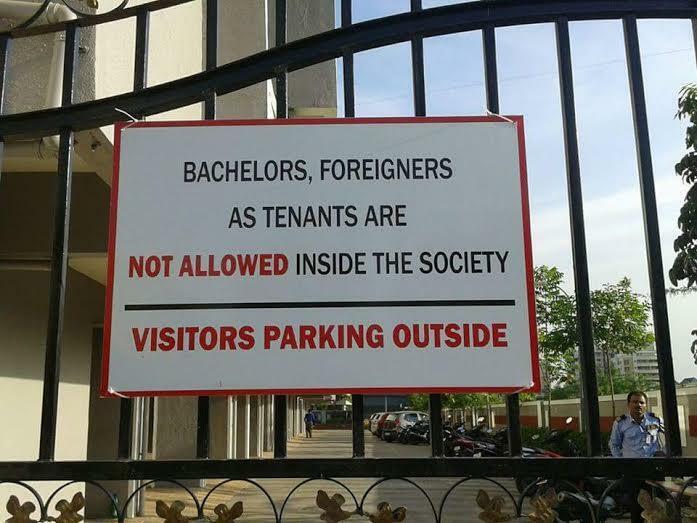 This is a sign board outside innumerable housing societies in India. Foreigners are not that frequently mentioned but bachelors usually get this board shoved in their face every time they look to legally find a house to rent. I have personally experienced this. I had moved to Mumbai (like thousands of people who do everyday) and I started searching for a house. I am not married. I have a regular job which allows me to find a half decent house. Its Mumbai so buying a house is out of question for more than 80% of the population of the city. Renting is the only way we can find a place to stay. Unfortunately and slightly funnily, my estate broker told me in the first fifteen minutes of meeting him that it would be easier for me to find a nice girl, marry her and then find a house than to try and find a house as a bachelor. He laughed. I did not. 1. Legally speaking, anyone who owns a house can rent out the house to literally anyone he/she wants to. There is nothing that any one can do. As long as the house owner follows the rules of the society, pays taxes and maintenance and fulfills all such duties as a resident, there is absolutely nothing that other members of the society can do. The owner of the house is a private individual and the property he owns is his private property, it means that he is free to do whatever he wants to with it. Society's 'rules' or 'model code of conduct' doesn't prevent any home owner from renting out their apartment to anyone they choose. As long as there is no central or state law which explicitly bars individuals, the individual is free to make his/her own decision. 2. Housing societies can make 'rules' to govern themselves. These rules apply as long as all members of the society want to follow them. They are not legally binding. Any member of the society can at any point of time, refuse to follow these rules. On the other hand, if all of them agree, they can make whatever rules that they think would help them. Given that its private property, no one can stop them from doing that as well. 3. Such anti-bachelor rules discourage young people from moving away from their home towns and living away from family even to explore better opportunities. It paints all bachelors everywhere with the same color and questions their character without any proof or justification. It is a classic case of generalization. Given the number of youngsters the country has right now, this concerns way too many people. 4. Parents whose children have lived in a different city know that pain of finding a nice home in a new city. They empathize with bachelors when their son/daughter becomes one of them. Unfortunately, its sometimes too little too late. Also, these numbers are too small to make any significant impact. 5. It might be true that families are 'safer' bets than bachelors in terms of maintaining the peace of the society and ensuring that nothing 'illegal' doesn't happen in the society. We have to remember that it is the decision of the home owner and not of the society members to take these bets into consideration. 6. It is true that there have been multiple instances of bachelors creating ruckus and also sometimes doing illegal things in rented premises. The response to that should be to hold these bachelors accountable and take them to the police if need be but the response should not be to put a universal ban on bachelors. It is like banning all men from the society because one man somewhere did something wrong. it is like banning all shops because you got cheated by one shop owner. 7. When you ban all bachelors, you are in a way discriminating against people who have chosen to not get married in their lives. The tenant can be 21 years old or 45 years old. If they don't want to, they have the choice whether they want to marry someone or not. It should not come in the way of them getting a place to stay especially when the owner of that house has no problem with it. Also, what about students who shift to another city to study? What if they are boys and are below the age of 21 and hence cannot get married? Should they be forced to live on the streets because the law doesn't let them marry and housing societies don't let them live? 8. There is also an economic aspect to consider, rent income is the support system of so many people in the country. It provides a steady source of income to individuals with little to no work to be done. When property prices are stabilized or are rising, buying property and renting it is a really wise decision. It makes property a lucrative investment location. If rent incomes start falling, its lucrativeness will reduce. People will start to find better investment avenues which will further quicken the fall. There are ways around it. Police verification of all tenants before a legal rent agreement is signed. It ensures that the bet placed on the tenant become a little more safer and gives genuine tenants a chance to find a nice house to live in. Don't let your housing society bully you into discriminating when you don't want to. Don't let your housing society make decisions about your private property. If you are housing society member who has genuine concerns about some tenants, talk to the owner. Take decisions on a case by case basis and not blanket decisions. It is in everyone's interest. P.S. - If I ever own a house, I will give it out only to bachelor tenants. Just to even the odds a little bit. But that's just me. P.P.S. - I love how housing societies write 'Visitors parking outside' like they own 'outside'. Maybe this is a post for another time. My society in Bombay has a bye law that BANS leasing altogether. I need a good lawyer to fight my case . Can you suggest.